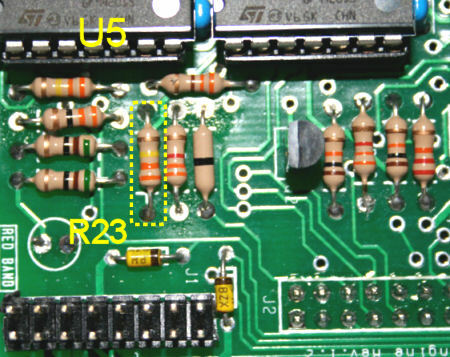 - misshapen serial out, due to build error in zener mod incorporation at Rev 1.2? (the links jump to lower down the page). A few minutes experimentation with the feature entitled 'phase lock' on an original M28 will tell you that it does not phase lock—it simply wasn't designed to do that job, and so applying the moniker 'phase lock' was a poor choice that was only ever going to lead to customer disappointment. 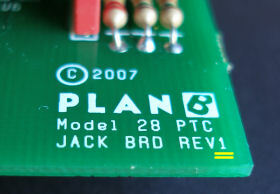 Fortunately Phil Gallo, the original developer of the software for the on-board microcontroller (the 'firmware'), was willing to work together on a collaborative effort to produce a new version which behaves very much closer to what a user would expect from a function called 'phase lock'—it is perhaps not acting as a phase-locked loop in the usual sense, but the output is able to very closely synchronize with the input, and also track it as it changes (within certain limits of course). 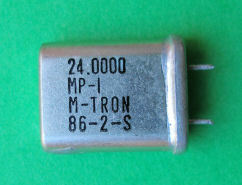 In addition a number of users have noted that the M28 phase lock input cannot be driven from some other clock modules, including (at least) the Doepfer A-160: it turns out that this is because the A-160 has a high(ish) output impedance, and this interacts with the input configuration of the M28 in a detrimental way, stopping it from seeing the clock transitions. Other modules it won't work with include the Doepfer A-146 LFO, but doubtless there are others from other manufacturers too. To make best use of the upgrade requires performing a minor modification to the input circuitry of the M28, and this modification also overcomes these compatibility issues (and indeed could be performed independently of installing the new software upgrade). 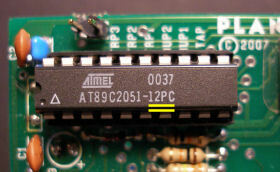 Phil has released a number of web pages describing the upgrade: in essence it requires replacing chip U1 (the big 20-pin IC on the board) with one programmed with the new software; the upgrade also requires that the incoming clock signal be inverted—it is recommended that a small hardware modification is made to the module to accomplish this, but the inversion can be performed by the use of other modules external to the M28. [Update Nov 2010]: Whilst recently adding the bit about resistor R5 at the bottom of the page, I realised I hadn't posted my method of performing the hardware mods to a Rev 1.2 board—whilst I provided Phil with my instructions for modding a Rev 1.0 board, the instructions for a Rev 1.2 board on this page are his method. 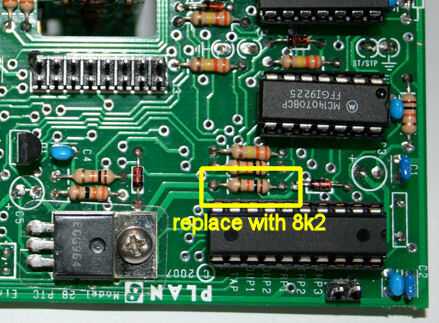 For Rev 1.2 boards I followed a similar pattern to the 1.0 boards—I have placed instructions for both board revision levels on this page, which is really just a slightly updated version of what I provided Phil in the first place. 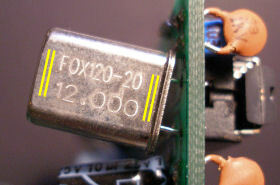 In addition to greatly improving the units capability to synchronize with the incoming clock, the upgrade includes a new feature that the more synth-DIY-oriented user may be able to take advantage of: the internal 24× frequency has been made available externally as a short pulse at an unused jumper location on the main board; with suitable interfacing to other clock-division modules etc, a new range of possibilities is opened up—for details see Phil's site. Some simple sound samples to demonstrate an upgraded unit's capabilities are to be found further down the page. Phil has stated that the new software in itself is free-of-charge: however an obstacle exists even for the most ardent DIYer who would want to perform the upgrade him/herself—that of actually re-programming the microcontroller chip, for which suitable programming equipment is required. Thus any third party carrying out the upgrade will necessarily incur costs, and they will obviously be looking to recoup these. As I have access to all the necessary tools, I have volunteered to offer such an upgrade service for UK- and EU-based module owners; Phil has arranged for Big City Music to provide an equivalent service for North American owners. I foresee several options existing, as follows. Resistor mods: I'll charge another �5 if you want the resistors changing for the accent and/or select mods detailed below. Postal charges: I would generally aim to re-ship the module in the packaging you sent it to me in, and (for UK owners) will use the same service as sent to me, which if either 'First Class Signed-For' or 'Special Delivery' I have factored into the figures above—we will need to discuss costs if anyone has any special insurance requirements over and above those provided by these services; for EU owners the cost will need to be increased to cover higher postage costs. My contact details are here, though I'm also happy to be contacted via the various forums that you may know me from. Note down what the '-xxxx' is, as highlighted in the photo. Revisions known to exist are 'REV1' (as shown), and 'REV1.2'. In the first two samples a square wave from an LFO is used as a clock into the M28 'phase lock' input: both the LFO and the M28's 'unmolested' quarters output gate separate EGs feeding their own VCA; two tones are routed through the VCAs—the lower tone (left channel) for the LFO, and the higher (right channel) is the M28. In the first sample I manually adjust the LFO speed: initially it is fairly slow, with the M28 tracking it; I mute each channel in turn, so that the two tones can be better distinguished; I then slowly increase the LFO speed and the M28 follows; when again the LFO is steady, I mute each channel once more—the 'crisp' tracking of the M28 is clear, and gone is the 'drift' that was evident before. I then slowly lower the LFO speed, and again the M28 follows, this time apparently not as accurately as on the way up (when going up a 'shorter period than previously' can be used to reset the internal counts, a luxury not possible when the period is elongated coming down), but it only takes a cycle for it to settle down once the LFO speed is constant. The second sample has a slow triangle wave from another LFO voltage-controlling the first, to show the behaviour in a slightly more dynamic setting. In the final sample we are listening directly to the envelopes, at audio rates. The M28 is able to track the incoming clock up to around 100Hz—as I increase the LFO speed beyond this, the micro in the M28 cannot keep up, and so the output vanishes, returning again once the LFO comes back within range. Since the M28 is primarily intended for syncing to tempos, this is unlikely to be a restrictive limitation! As with just about anything you buy, if you start messing around with it yourself, you will almost certainly invalidate the manufacturer's warranty. This applies equally well to any changes anyone attempts to their M28 (as it does with all mods on my site). This also applies of course if you ask me to make those modifications. Other than a desire to help the synth community out, I have no business or contractual or any connection with either Plan B/Peter Grenader, and neither am I acting as their/his agent in any capacity whatsoever. I reserve the right to alter the costings above, without warning, if it becomes clear that I need to, for whatever reason. The red trace is the LFO 'clock in' to the phase lock input, as a timing reference so the two blue accents can be distinguished; the green and orange traces are the two accents on an expanded timebase, overlaid for a better comparison. The effect can be readily heard by modulating a VCO with the accent out: in this small sound sample, high and low pitches alternate as the VCO reacts to the accent pulses, and the two high pitches are clearly different, due to the different accent amplitudes. 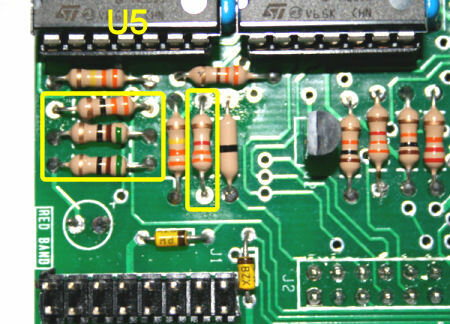 I have had satisfactory results on several modules swapping the original 10kΩ for an 8.2kΩ, as the following traces show (the green and orange are pretty close now), though others have reported needing to go down to 5.6kΩ—this is hardly surprising given the generally poor specification of resistors fabricated inside chips. Finally here is a second sound sample of a module after the mod, modulating a VCO as before (note it is not the same module as the traces, but you get the idea...): the two higher pitches deriving from the accents now sound the same. If there is a reason for having a non-zero value for that fourth resistor, I don't see it: its effect is to cause a second window of about 0.1V wide during which quarter notes are again output from the serial out. That is, the sequence (for increasing select in) is quarters, eighths, quarters, and then eighth triplets. The trace above doesn't really show this, but it is readily apparent if the select input is fed from a suitable, easily adjusted CV source. 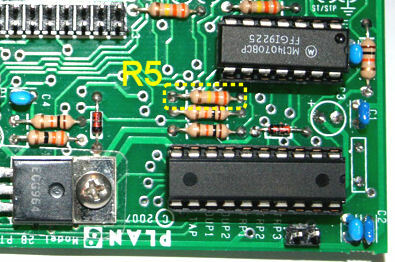 In earlier units a mod involving a zener diode was used to overcome the deficiency introduced by this resistor being in the wrong place; at Rev 1.2 this mod (amongst others) was incorporated directly onto the PCB (one of the yellow zeners in the above photo), and thus my guess is that perhaps at some point it was realised that R23 was useless and so could be omitted, but maybe somehow it got confused with R5 ...? Depending on what use the serial out is put to, this misshapen waveform in itself may not cause any particular problems. However, also shown is the cause of the unevenness: the mauve trace is actually the +5V rail (!) when the problem is present, and the orange trace is what it should look like (namely 5V! )—note especially that the mauve is considerably greater than 5V at some points, and indeed, it is peaking perilously close to the 'absolute max' supply voltage of 6.6V for the large AT89C2051 microcontroller chip! (Turning the select voltage down to give eighth notes out restores the +5V rail to where it should be.) I have no idea whether prolonged operation in such a condition might actually damage the big chip, but I'm quite sure that I would rectify this if I had this problem on my unit! The solution to this issue is to merely replace any 1N4148 types fitted at these two locations with low-wattage 5V1 zener diodes (4V7's would do equally as well). 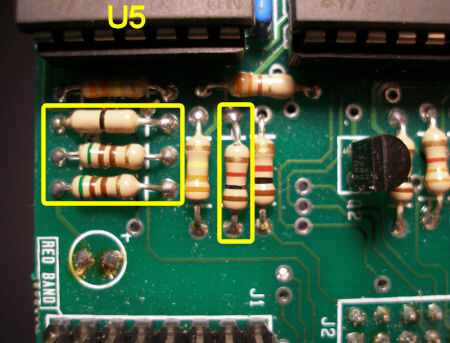 Also the zero-ohm link highlighted in the first photo in this section should be replaced with a 1kΩ resistor (it acts as the current-limiting resistor for the one zener diode). It suggests both that the maximum swing of OA out is reduced considerably due to the large load placed on it (my crude measurement suggests that in this situation the current draw on the +12V rail increases by about 20mA), and that the forward-biased diode at the chip input is not entirely clamping the +5V rail, as the drop looks too big (more than a volt), so there must be some potential divider effect in there too, which changes with the load on the +5V rail, which explains why the waveform is so 'castellated', according to the load on the +5V rail as other chips in the circuit are switching on and off according to all the quarter/eighth/triplet-type pulses around the place. All rather unseemly. Tim Stichcombe did not fix these errors, he - along with Don Kim - merely served as beta sites for the changes done by the original firmware designer Phil Gallo in early 2010. Phil worked on this for close to six months and there were over 50 M28's produced and subsequently sold by two dealers with this firmware incorporated. 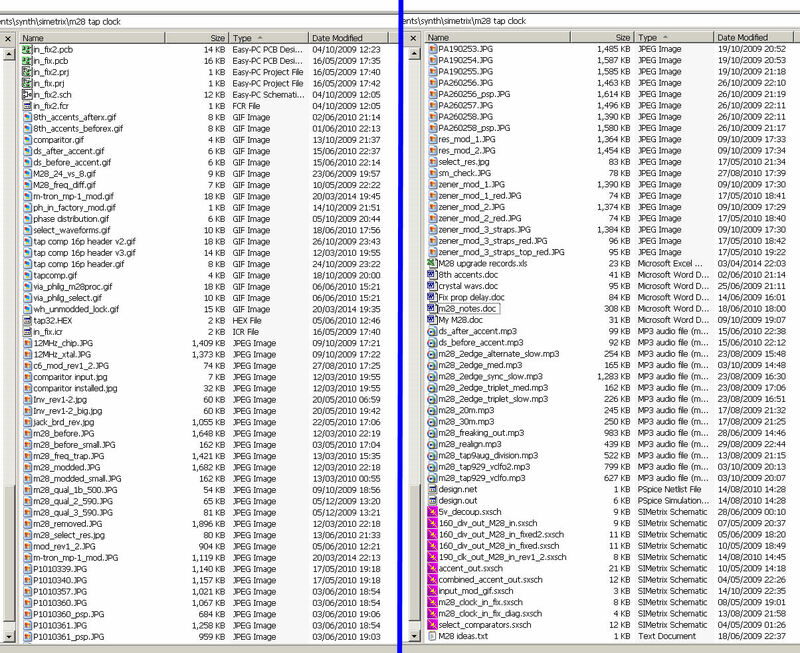 Here are directory screenshots of the main M28 folder on my computer, and a photo of the ring binder containing all my notes, to give an impression of the quantity of the work involved in the upgrade: 'merely a beta tester' my arse—I was instrumental in driving the upgrade through!